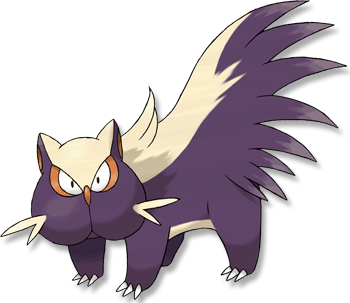 Stench The stench helps keep wild Pok�mon away. If this Pokemon is first on your belt, the chance of a wild encounter drops. Aftermath Damages the foe landing the finishing hit. "When this Pokemon is fainted by a contact move, the attacker takes 1/4 its max HP in damage." Keen Eye* Prevents the Pok�mon from losing accuracy. This Pokemon cannot have its Accuracy lowered. Diamond/Pearl It sprays a nose-curling, stinky fluid from its rear to repel attackers. Platinum It sprays a foul fluid from its rear. Its stench spreads over a mile radius, driving Pok�mon away. Heart Gold The foul fluid from its rear is so revolting that it can make people feel queasy up to a mile and a quarter away. Soul Silver The foul fluid from its rear is so revolting that it can make people feel queasy up to a mile and a quarter away. Black It sprays a foul fluid from its rear. Its stench spreads over a mile radius, driving Pok�mon away. White It sprays a foul fluid from its rear. Its stench spreads over a mile radius, driving Pok�mon away.